Club Carlson has promotion for a stay at any of the participating Park Inn hotel in the Americas (US, Canada & Latin America). You can earn 15,000 bonus points for one stays between September 30 – December 31, 2015. This offer requires registration. Note that the terms state that the stay must be both booked and consumed during the offer period. This is a nice 15,000 bonus points for a stay at Park Inn hotel in the Americas (not that many BTW). Should be combinable with any other bonus points promotion that could have overlapping dates. 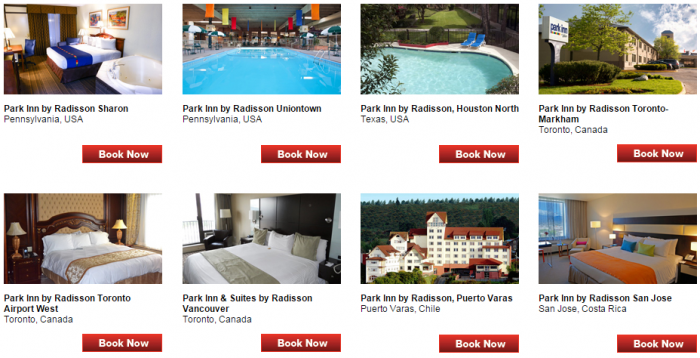 To participate in the Park Inn by Radisson Promotion, you must register at clubcarlson.com/parkinnfreenight and complete and pay for an Eligible Stay at any Park Inn by Radisson hotel in the U.S., Canada and Latin America between September 30 and December 31, 2015 (“Promotion Period”). Promotion is valid for 15,000 bonus Gold Points for one Eligible Stay booked and completed during the Promotion Period. Members can earn only one bonus during the Promotional Period. Stays paid for using Points + Cash and other point redemption rates are not eligible for this Promotion. Subject to availability. Must be a Club Carlson member to receive points for this Promotion. Please allow up to 14 days after departure for Gold Points to post to your Club Carlson account.